Reproducing the cannon will require the participation of a number of trade shops: founders, blacksmiths, wheelwrights, gunsmiths, harness makers, tailors, weavers, brick makers, tool makers, and carpenters. Together, they will illustrate the complexity of production needed to support the Revolution. After turning down the surface of the casting several tenths of an inch, we’re finding even more porosity, including some large, and relatively speaking, deep holes. While this is disappointing, discovering such problems was the reason for this initial pour. You don't need to re-cast a cannon to fire up a good observational blog. What processes, observations or methods can you unfold for your blog's readers? 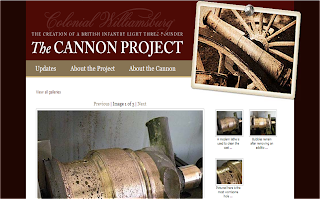 Can you chronicle a project--the cannon will take two years' work--or follow a new initiative? Are there new things to discover and describe at frequent intervals? Then you may have a true log-blog in the making.